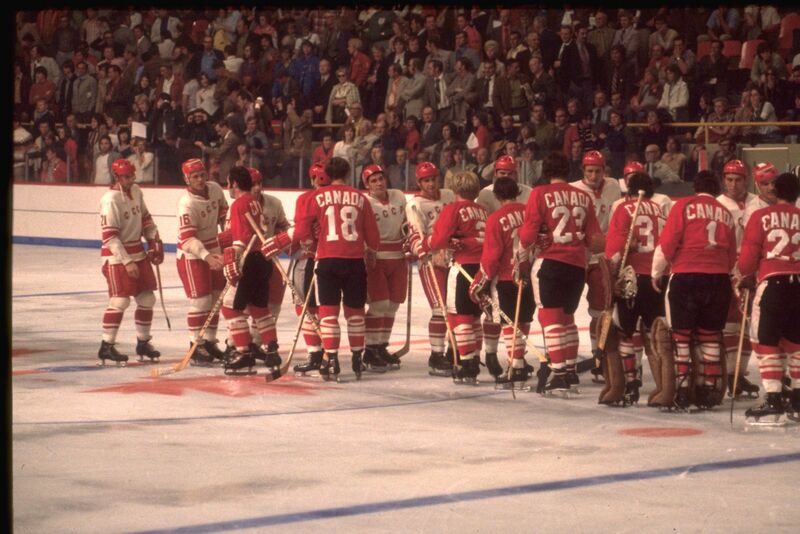 The 1972 Summit Series is, at its core, one of the greatest hockey narratives of all time. Just look at the “Reflecting on the 1972 Summit Series” post from earlier this week (or Part 2 of the same name) looking at over 20 different perspectives of the series, and it’s easy to see the massive impact those eight games had. It’s the story, that, if you’re Canadian you tell your children about, and your grandkids, if you’re lucky. If you’re reading this post, you’ve probably already got a good grasp of the events of the Series. If not, there’s more material about it to read and watch than likely any other hockey competition in history. It’s almost a larger-than-life, comic-book like historic battle between two great powers. But it’s now been 44 years since the famous game-winning goal by Paul Henderson (or three goals, if you want to be more specific), and enough time has passed to end the love affair with the series. No, we shouldn’t forget it, but let’s stop glorifying it. What is the Summit Series representing, at its core? It’s the epitome of a Canadian Heritage Moment- sitting on your couch, or in a bar, or in class, or at work , or just about anywhere else, really, picking up the CBC radio or television feed of those eight games stretched out across the entirety of September. It’s an event big enough to shut down an entire country, or so the narrative goes. With the current NHL (and let’s be honest, everything else in the world) marketed and over-marketed the way it is, the gimmicky World Cup of Hockey that we’ll all still probably watch and care about instead of griping over training camp, and the uncertainty of the inclusion of NHL players in the Olympics, the Summit Series was in many ways, the “purest” international competition of best-on-best hockey we’ll ever see. The outcomes became almost indoctrinated into anyone who grew up with them. Lose one, in Montreal. Win one, in Toronto. Tie one, in Winnipeg. Lose one in Vancouver, then lose another one in Moscow. Win the next two in Moscow, and have a game eight for all the marbles. Well, maybe not, but we’ll get to that later. There was nothing tangible on the line, but there was also everything on the line. It’s a Series memorable for a slash, for a speech by Phil Esposito, for a trio of winning goals from a player who probably didn’t even make a whole lot of sense to be on the team. It’s a gateway to a new culture, and a new brand of hockey. For the first time ever, really, Canada was given the chance to a truth that still rings true today – as a whole, we’re the best at one thing. Today, even if there’s incredibly strong development in other countries, even if there’s players from the USA and Sweden and Finland and Czech Republic and elsewhere winning individual trophies and leading Stanley Cup pushes and captaining teams and standing among the league’s best superstars … there’s still no real debate as to the hockey country which is the “best”. Olympic Gold 2002, Olympic Gold 2010, Olympic Gold 2014. Canada 3. Everyone else, 2. Add the four successes of the Canada Cup and the World Cup win in ’04, and Canada’s results in true best-on-best events is unmatched. There are four Canadian teams in the history of best-on-best hockey that didn’t win it all in an organised competition involving no restrictions (i.e., during the NHL playoffs) on professional players. There’s the 98′ and ’06 Olympic teams, the ’81 Canada Cup team, and the ’96 World Cup team. That’s it. Every other Canadian team was crowned champion. There’s eight championship wins, and four losses. It’s not an argument at all. And boy, do those losses sting. I’ve lived through two of them, remembered one of them, and my goodness, it was abysmal. It’s almost like a personal insult to see something you’d been looking forward to for so long go so catastrophically wrong. But with each loss, we’ve been humbled and angered as a country quite a bit, and besides the close proximity of 96′ and 98′ losses, found “redemption” just a few short years later, every single time winning at the next available best-on-best opportunity. You can, and should critique a lot of things about Canadian hockey culture, but it’s hard to critique the results of the *men’s national team. (The importance of *men’s hockey: I would love to say that Canada is clearly the best hockey country in both the men’s and the women’s game. As a Canadian, and a hockey fan, it’s a great ideal to envision. But the answer isn’t nearly as clear-cut as on the men’s side. Four straight Olympic golds might sway many’s opinion towards Canada… but 6 out of the last 7 World Championships have been won by Americans. Despite the shortcomings that may exist in team selection, player development and a host of other management issues, there’s not a single country who’s done better than Canada on the international true best-on-best format, and the Summit Series was the first of those wins. In a sport where the North American world had yet to discover the beauty of the European game, everything came together to create “the moment”, the goal that’d be replayed on every single Canadian hockey highlight reel for eternity. With 34 seconds left, “Henderson has scored for Canada” served as a call those who heard it would never forget. It’s the biggest championship the country’s ever won that wasn’t really even a championship. From Game 1, right through to Game 8, there were a million tiny moments that made the Summit Series special, and unlike any other international competition before or after it. Canada came into the Series believing they were the best hockey nation in the world, and left feeling the same way. It’s our game, we invented it, it’s something we’re proud of and good at and better than everyone else. It’s something that gets marketed into our beers and our Saturday nights and our summers and every aspect of our life. Hockey is something that’s undoubtedly Canadian… until we realized it wasn’t. Today, despite its origins, hockey is quite clearly not just a Canadian game, and not even a North American game or a European game. It’s a game that’s ever-expanding and finding new players from different markets all over the world. We might be the best at it and it’s fun to brag about, but it’s a game that’s enjoyed and played by players all over the globe. Its origins are Canadian and and it might match well with our cold climate and. Sometimes, as we all know now, the best players might not be Canadian. The most recent pick first overall pick in the NHL draft was born in Arizona and has a dual Mexican-American citizenship. Would your average 1972 Canadian have believed that to be possible? In my Grade 10 history class just a few years back, we were going through a list of great Canadians and historic events, and our teacher was asking students to give a brief description of either a person, or the event that they participated in. There were the standard names- some Prime Ministers, some explorers, Terry Fox, Alexander Graham Bell, and so on. No one was overly passionate about the exercise, but the offered participation marks caused a few hands to go up and half-heartedly answer each question, most of which were fairly common knowledge for Canadian Grade 10 students. But when Henderson’s name came up, my hand was the only one raised. So I gave a brief description, first saying “Oh, he scored the winning goal in the Summit Series,” thinking that’d be sufficient evidence and maybe my classmates had just forgotten a relatively generic name. But no, it wasn’t that. Even the words “Summit Series” didn’t register with the 20 or so classmates of mine. If anyone knew what I was talking about, they didn’t show it. It felt like almost a national tragedy at first, but I figured I’d have to just explain in a few short sentences about the Summit Series. Bringing up the idea of a series between Canada and the Soviets turned on a few lightbulbs in the heads of my classmates, and I got a few “oh that’s what it was called,” responses, but regardless, no one in that class could answer the year, the scorer, or even the actual name “Summit Series”. One Toronto high school history class shouldn’t be used as a proper sample size to gauge the interest of an entire generation, but I don’t think the results would be all that different in many areas across the country. Like many things, it’s an event that’s a generational gap. And with every generational change, the values of the society change as well. It’s a series that’s lost its lustre to much of the modern youth. When we celebrate the Summit Series, what are we really celebrating? The Summit Series is memorable for many things, but it’s often remembered mostly because, well, Canada won. If we were solely focused on the event as a whole, there wouldn’t be endless replays of the Henderson goal. It’s a great series as is, but it’s even better because we WON! But when you strip away most of the details behind it and just focus on the mindsets going into the series and the results that came out of it, the Summit Series comes down to a sense of unabashed nationalism and intense overconfidence followed by a great humbling period and a three-game comeback. “We thought we’d win easily, almost lost it by Game 6, then recovered and all was well,” could be an apt tagline for a Series summary video from the Canadian perspective. But of course, as we’ve touched on, it was the birth of many great things. There was no gold medal on the line, but there would be ones that resulted from this series. The goal from Lemieux in 1987 to win the Canada Cup? Crosby’s OT winner in the 2010 Olympics? Would either have been possible without the Summit Series? It’s likely modern international hockey in some form would’ve happened eventually due to the constant globalization of the world, but it’s hard to say the future of the hockey world wasn’t forever changed by the eight-game Series in 1972. The Summit Series was far from useless, but it’s far from perfect. No matter how you slice it, 1972 was a far different world than 2016. It was one of a xenophobic culture where the overarching belief was that the Canadian way of playing hockey was the best, only and right way. The Summit Series humbled these beliefs, but winning it still proved some kind of superiority. Today, it’s clear that’s it’s not the case that Canadians are the only ones doing it “the right way”. The NHL has many, many social problems that still exist, but it’s quite obvious to most people now nationality is never a good reference point to judge a player’s ability. There are great Canadian hockey players and great Russian hockey players and great American hockey players and so on. There are terrible players from these countries as well. There may be similar playing styles and trends present of players from similar development systems, but at the end of the day, no two players are exactly alike, and using a nationality as anything more than a brief point in a scouting report is a lazy and often untrue stereotype. So it’s easy to critique Soviet politics and the militaristic approach to athletic development. Hell, it’s quite easy to critique modern Russian society and sport as well. But it’s much harder to critique the new developments the Soviets brought to the game, and the eventual European playing styles that would make their way to the NHL. It’s been nearly a half-century now, and yet the Summit Series remains glorified in many ways as a great Canadian victory. And it was, on the ice. It was a series of wonderfully battled, competitive, hard hitting, gritty hockey. But when we celebrate Canada’s victory in 1972, we’re celebrating something else too. We’re celebrating a close-minded, exclusive culture. We’re celebrating old, expired values. The idea of intertwining sports, politics, and social issues shouldn’t be lost when looking at history. It’s okay to remember things and have enjoyed them while being able to be critical about them too. It’s okay to learn about new things and have a different opinion on them over time. History’s written by the victors, the old saying goes. So let’s re-write this chapter a little bit, or at least the way we tell it. The Summit Series is many ways, a foundational piece of the modern NHL and gave life to a whole new field of international hockey. But it’s an ugly foundation in many ways laced with some ugly ideas. Celebrating the Summit Series as something wholly Canadian is a slap in the face to the developments of the modern game and the players that have developed outside of the country. It’s unfair to non-traditional markets and even now the other major hockey markets we see as traditional – like Sweden, Finland, Czech Republic. It’s an ignorant time in our history, but we seem to have forgotten and washed over that because, well, Canada won. Let’s not forget the details, and start telling the proper story of the Summit Series.